Hey, do you even map bro? | Spatial stuff for everyone! The thing is that identifying these edits is not that as straightforward as it seems. There are different ways to indicate the source of edits. It can be attached to features, but personally I think that’s not the best solution. There’s no need to store redundant information, especially when making thousands of edits in a batch session. But we are all different and that’s totally OK. Some users use this method. When quickly querying the database for ‘Szeged ortofotó 2011’ tag everything goes crazy and a decent portion of my screen turns blue. Take a look at the picture below. That’s almost 450 tagged individual features (mostly buildings but there are a few lakes, a football field, a tennis court and some paths)! So people actually used what I thought is useful. I mean, whoa! So, we have at least 450 edits. That’s not too bad considering that the recommended method to tag these edits was to attach source tag to the changesets. Wait, does it mean there’s more?! Yes, absolutely! They’re in the changesets! First thing is to query changesets. I imported all of them on my local machine and made a dummy query to get most of them. As it turns out, iD editor does not use source for changesets for most of the time (what a bummer, I should’ve thought of that). So, taking some variations into consideration, currently I check `source` `comment` and `imagery_used` tags. Let’s see what we have. I mean let’s see WHAT WE HAVE! With capitals… because there are 18 different mappers submitting 206 changesets with almost 22k edits. Yes, almost TWENTY TWO THOUSAND map edits all over the city. Number of total users may not seem extremely high but there weren’t any campaigns organized around this data or anything. They just came because they felt like mapping. And when they come, they map. I bet these changes resulted in thousands of new mapped buildings throughout the city and possibly in many more important map elements. Not too bad, eh? The map below shows where these edits occurred. Stronger red means more overlapping changesets. At first sight, it’s interesting to see that most changes were not made in the city center but further away, mostly in residential areas. It probably indicates that the primary focus of the edits are buildings (and they were already well mapped around the city center). What’s the editing intensity? Maybe cross checking activity with forum and mailing list talks. What features have been edited? Buildings, roads? What’s the nature of edits like? Did users mainly correct existing features? Did they mainly map new objects? Many things need to be done to answer all this. Although there’s been some discussion about a History API and about tools to query features based on changeset metadata here and there, I don’t know of any solutions off the top off my head to identify features in these related changesets. Since I already have a full history dump with the changesets, I’ll probably create my own solution to match changesets to real edits based on time and location, and to extract all the info needed from there. I’m open to other solutions, though. 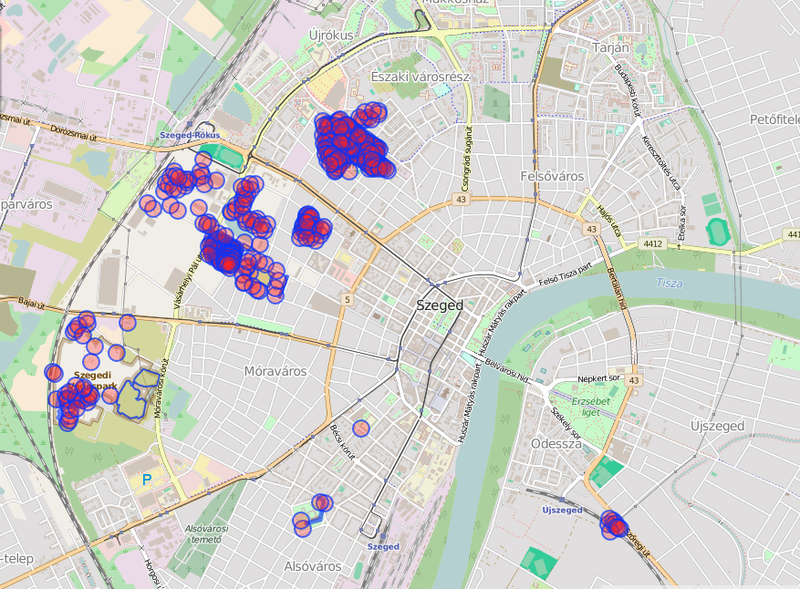 In any case, available geodata from Szeged has already been improved a lot due to just making some data from the drawer available to the public. Let it be the main message of this post. Make your data available to the public and let everyone benefit from it!